Is Donald Trump’s vulgar behavior inspired by a former white supremacist and Princeton University President? The answer is probably not, but there are some interesting similarities. Democrat, Woodrow Wilson, our nation’s 28th President, often makes Donald Trump’s social views seem downright liberal! If you skip over the Disney-like, sanitized textbook version of Wilson, you might not like what you find. Wilson, a white southerner, had racist views that were considered harsh, even for a much less tolerant era. His wife’s opinions were even worse! When he was President of Princeton University, Wilson established a policy of refusing to accept the applications of non-white students. Princeton thus became the only major northern university to institutionalize racism. 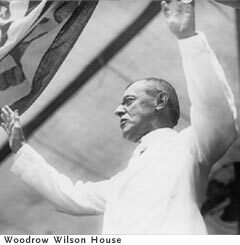 When Wilson was elected President in 1912, he tried to pass major legislation that would severely curtail the rights of African-Americans. Fortunately, Congress stepped up and blocked his proposals. Wilson then turned to his executive power to spread his racist agenda. For example, he segregated the United States Navy. The only jobs that were now available to African-American sailors were those in the boiler room or kitchen. This policy did not exist before Wilson was elected president. Wilson did not stop there. D.W. Griffith, the film’s creator, used material from Wilson’s two volume History of the United States as inspiration for the film. Griffith also employed Wilson’s defense of his movie when he responded to charges of racism by the N.A.A.C.P. Today, there are many who cringe when Donald Trump cries for the need for “poll watchers” to guard against a “rigged election by the media.” The thought of civil insurrection terrifies us all. During Wilson’s Presidency, the nation had its own form of insurrection. This was mainly directed at minorities and immigrants. Acts of violence took place often on the basis of implied approval by our Commander-in-Chief. The KKK staged a dramatic revival during Wilson’s two terms. The numbers of reported lynchings increased dramatically and were reported as far north as Duluth! Donald Trump has been accused of being anti-immigrant with a special bias against Mexico. Wilson’s stances make Trump seem almost Ghandi-like! Talk about an equal opportunity offender! While Donald Trump threatens to “lock up” his presidential opponent, Hilary Clinton, Wilson actually did just that to his opponent! Socialist and presidential candidate, Eugene Debs, was sent to jail for violating the Espionage Act of 1917, which Wilson signed into law. He followed this with the Sedition Act one year later. These two laws were implemented during the First World War to protect the United States against domestic threats and foreign spies who could impede the war effort. Debs was jailed for accusing the United States for going to war for economic interests and criticizing the Sedition Act. Film maker Robert Goldstein spent three years in jail for making a movie, “The Spirit of 76”. His alleged crime was portraying war ally, Great Britain, in a negative manner. Though there were no reports of groping women, Wilson had “women issues” nonetheless. Though the 19th amendment was passed during his second term giving women the right to vote, Wilson often fought it every step of the way until finally giving in, due mainly to political expediency. In fact, he did nothing when suffragettes, like Alice Paul and others, were brutally treated and arrested for civil disobedience. This included heinous “forced feedings” when they went on hunger strikes to protest the unfair treatment of women during this period. Ironically, Wilson’s presidency is remembered for many progressive reforms. These include the progressive income tax, the Federal Reserve Act, and a program for Workers’ Compensation. These accomplishments were tarnished by his anti-immigrant, and racist actions and attitudes. On the plus side, under the guise of the slogan, “Return to Normalcy,” Wilson’s policies were violently rejected in the subsequent 1920 presidential election. Warren Harding, a Republican, soundly defeated Wilson’s successor James Cox, by a record 64% of the majority popular vote (a record which still stands today). Wilson’s actions made the Democratic Party inhospitable for African Americans for over the next two decades. While cable news channels howl today about the possible horrors of a potential Donald Trump presidency, our nation has seen worse and survived. Neither should you when it comes to politics, outrageous politicians and their antics. Source: Lies My Teacher Told Me: Everything Your American History Textbook Got Wrong by James W. Loewen. If Banks Are so Friendly, Why Do they Chain Down the Pens?